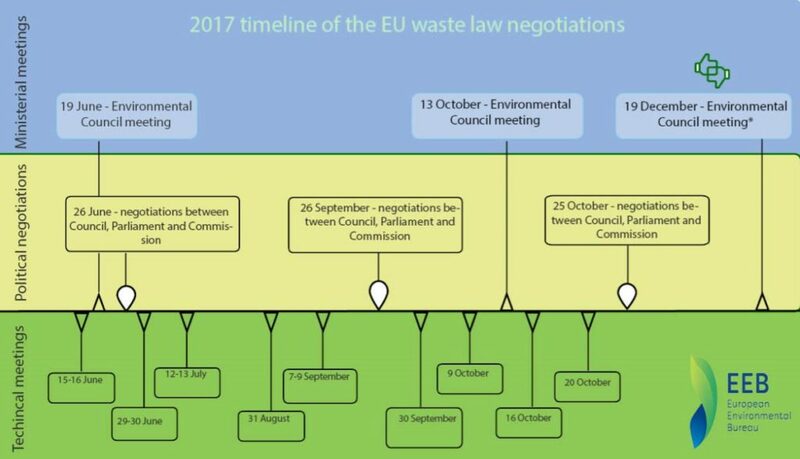 Ongoing investigation by NGOs exposes divide and doublespeak among EU countries on waste law proposals. In May, an investigation by the EEB, Zero Waste Europe and Friends of the Earth Europe revealed which countries are sabotaging the transition to a circular economy. As we continue to monitor the negotiations on the EU waste proposals, we show that a number of countries are shying away from their commitment to a stronger and more resource-efficient economy. EU Policymakers and NGOs, along with a large number of industries, agree that moving to a circular economy – where waste is prevented and products reused or recycled – is the best solution for the planet and for business. But the EU Council’s position, agreed in May by member states led by the Maltese Presidency behind closed doors, is currently significantly less ambitious than that presented by the European Commission and Parliament. If a regressive position is to prevail in the negotiations, plans to accelerate the transition to a circular economy in the coming years will most likely stall. Recent leaks from Council meetings and insights into national developments expose divide and doublespeak among EU countries. Romania, despite claiming a supportive stance, backed a weak position on waste prevention and asked the Council for time derogations for recycling targets. At home, the country is moving forward with plans to postpone the introduction of a landfill tax and build three expensive incinerators – which imply a greater amount of valuable resources will be burnt or buried rather than reused or recycled. Even less ambitious was Poland’s latest position on recycling, as made clear in a recent meeting of environment ministers. Government officials, who in May refused to share their position with NGOs, called for a 50% recycling target by 2030. To put this into perspective, the existing target is 50% by 2020. On the bright side, Germany recently affirmed it will support a 65% recycling target as proposed by the European Commission, despite having previously dodged the question. This means that there is now strong support for higher recycling targets in many EU countries, particularly ones with high populations – something that the Presidency of the EU Council needs to take into account. Denmark, Finland, Hungary, Lithuania and Latvia remain the most regressive countries opposing most of the proposals. These are followed by the Czech Republic, Italy, Sweden, Portugal and Luxembourg, which reject higher ambition on waste prevention despite backing higher recycling rates. Germany also fits in this category, having confirmed its opposition to waste prevention proposals – a priority in the circular economy. Ireland, Slovenia, Croatia and the UK refused to share their position with NGOs in May, and appear to have remained silent in recent discussions. Leaders in the negotiations remain, as NGOs announced last month, Greece, France, Belgium, the Netherlands and Spain. These governments are calling for stronger support for recycling, waste prevention, preparation for reuse and better separate collection. *Negotiations may continue in 2018 if member states fail to reach a satisfactory agreement. The Maltese Presidency kicked off the negotiations in May. The Estonian Presidency will lead the discussions from July to December. If no agreement will be reached by the end of the year, the Bulgarian Presidency will take the lead in 2018. Objectives to reduce waste generation. See the EEB reaction to the latest Environment Council meeting on 19 June. See how countries responded to our questionnaire before the start of the negotiations in May.